We had ancient Greek Mythology: e.g. Zeus begets Athena through Titan goddess Metis before marrying Themis. Aphrodite marries Hephaistos while sporting a long love affair with Ares & later Poseidon. Then Poseidon casually disguises himself as Enipus to trick Tyro into sleeping with him. The drama. The scandal. 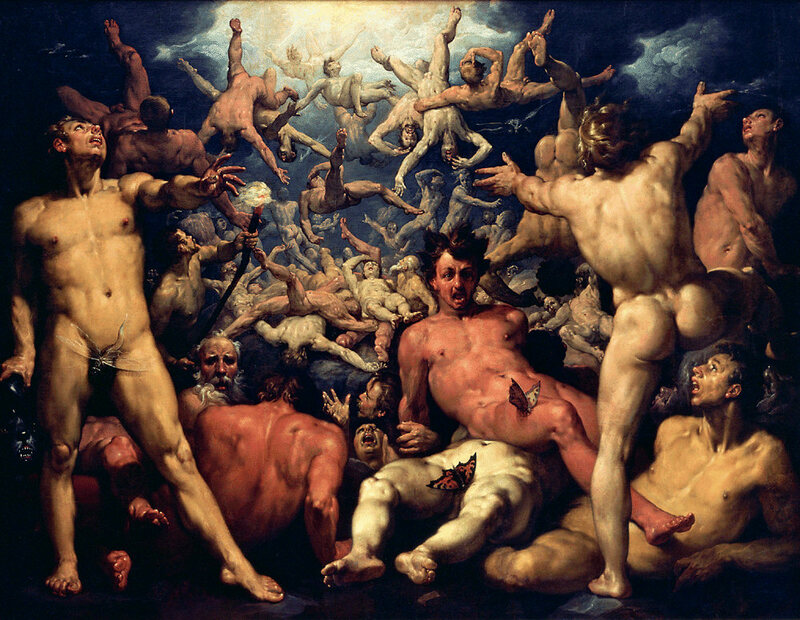 The kosmos. Embedded in the myths is Coeus (or Koios), Titan God of Intellect, inspiration of KOIOS, the nootropic supplement stack. Judging by its source of inspiration, KOIOS can either go horribly right or fantastically wrong… I’m not sure what’s better or worse. The clean label & clever marketing grants initial appeal to this nootropic stack, particularly towards competitive athletic & gaming individuals. Awesome ingredient choices limited by questionable ingredient forms. 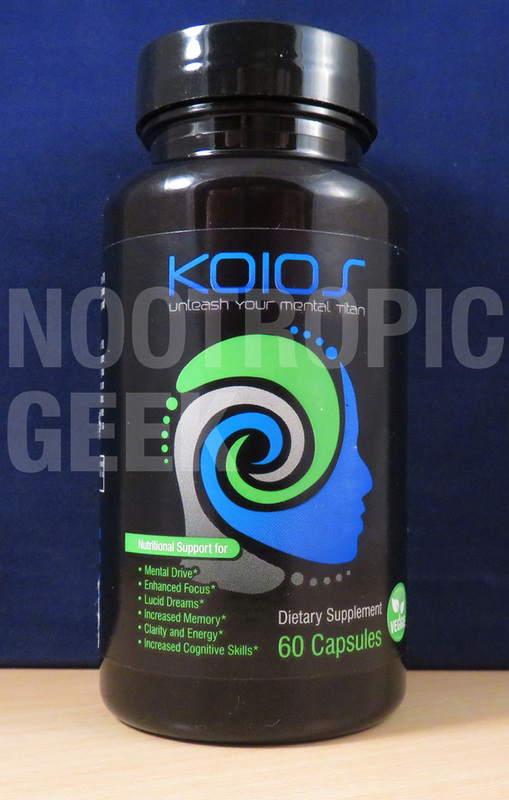 KOIOS knows how to choose its nootropics, but strangely opts for cheap quality. The Mental Titan Blend is a proprietary blend, thus hiding all of its ingredient dosages from the consumers. Not a good look. 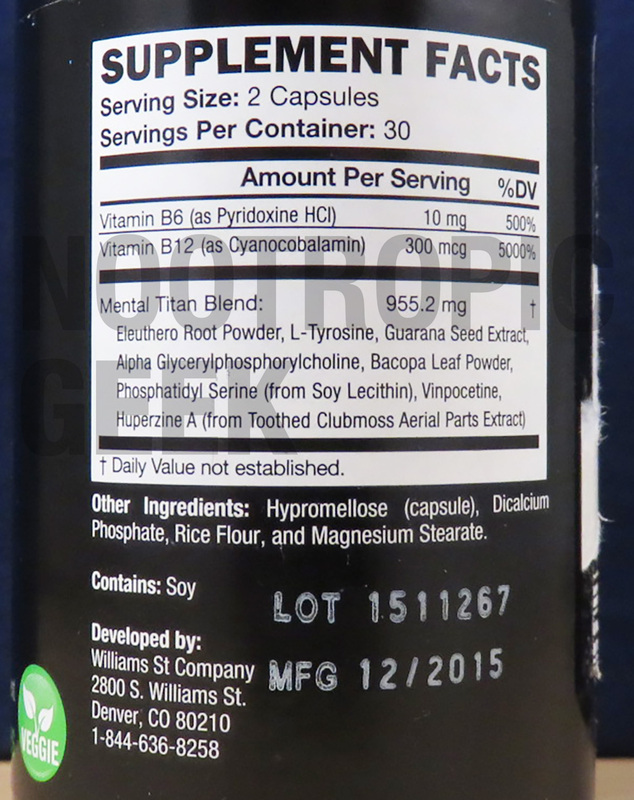 Other Ingredients: Hypromellose (capsule), Dicalcium Phosphate, Rice Flour, and Magnesium Stearate. Contains: Soy. Directions: As a dietary supplement, start with one (1) capsule to assess tolerance and work your way up to two (2). Do not take more than 4 in a day. Read warnings and only use as directed. Listen. Unleashing the mental titan is what I’m all about. I claim that phrase as my modus operandi. However, although KOIOS’ tagline speaks to me on a literal & metaphysical level and although KOIOS chooses smart nootropics to back it up, its ingredient qualities fail to walk the talk. Forget the formula. Unleash the tanks. B Vitamins – B6 & B12 are solid vitamin choices for cognition, mood, & brain health. But both of them could be upgraded to higher quality forms: B6’s pyridoxine HCl to “active” P-5-P; B12’s cyanocobalamin to cyanide-free methylcobalamin. L-Tyrosine – Another powerful anti-stress compound, particularly during conditions of stress. But… KOIOS uses the wrong form again, instead of higher-grade N-Acetyl L-Tyrosine. More on L-Tyrosine. Guarana Seed Extract – Amazonian plant with decent fat-burning + brain-stimulating benefits, most likely due to its potent caffeine content. More on Guarana. Alpha-GPC – Good ingredient. Cheap form. Alpha-GPC is a notable choline donor, increasing focus & memory. Citicoline is an even better choline donor for focus & memory. More on Alpha GPC. Bacopa Leaf Powder – Bacopa’s bacosides are true geek fuel, enhancing various long-term aspects of knowledge retention & mental performance. KOIOS sides with cheap, low-bacoside powder. More on Bacopa. Phosphatidylserine – Great brain-boosting memory enhancer–in fact, the only nootropic with a bona fide FDA health-claim. 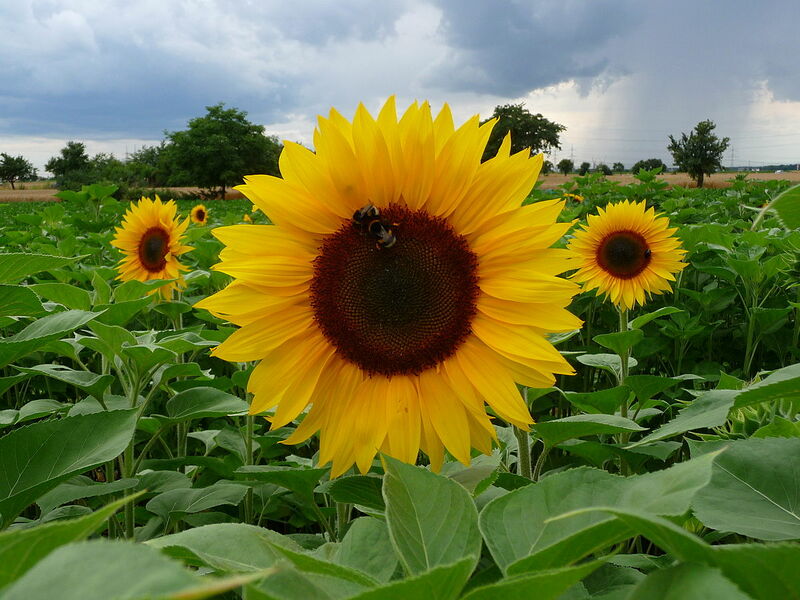 Recent trends are gearing towards sunflower-sourced PS, but this Soy Lecithin flavor should still work. More on Phosphatidylserine. Vinpocetine – Another great brain-boosting nootropic, supplying acute mental charges from its cerebral blood flow boosts. 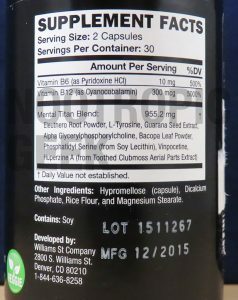 I’m a particular Vinpocetine fan due to its low required dosage (5 mg) for significant nootropic bio-action. More on Vinpocetine. Huperzine A – Often stacked with Vinpocetine, Hup-A is also effective in small doses & seems to help restore brain chemicals, brain cells, & mental energy. More on Huperzine A.
Theoretically, the combined synergetic potential here is high for its intelligent multi-angled approach on brain health & mental power. Strictly judging on the ingredient choices, KOIOS’ moniker “mental titan” seems earned. Mental Titan Blend is a proprietary blend–in effect, obscuring the individual dosage of each ingredient. Although the low-prioritized ingredients (Vinpocetine + Hup A) require small dosages, I still have to question whether: A) 955.2 mg is enough for all of these nootropics, and B) If that 955.2 dosage is appropriately distributed across the blend. Frankly, I want questions answered, not produced, by a Supp Facts table. Additionally, the ingredients are overwhelmingly in cheap, inferior forms. Poor nootropic quality doesn’t outright spell “poor bio-efficiency” for each ingredient. After all, we’ve benefited from these natural ingredients for eons without the need of high-premium, high-potent extracts. Yet, when I see a supplement that sets its standards low on nootropic quality, I have to wonder what else is being sacrificed by the manufacturers for the sake of profit? Its website includes the nootropic Cat Claw, a traditional herb currently investigated for brain health purposes–yet, the Supp Facts fail to include it. Not that I’m about to throw on the tin-foil hat and cry conspiracy, but underneath the sleek, shiny (& admittedly clever) marketing of this supplement, there seems to be some shady happenings happening here, ya dig? 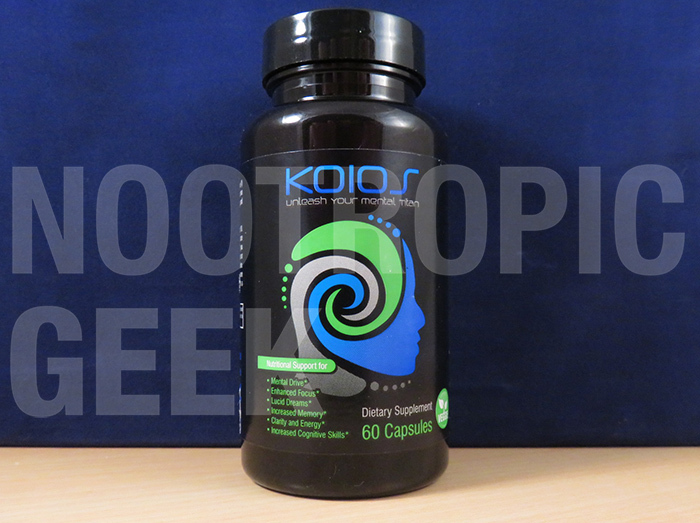 KOIOS undoubtedly knows how to choose the right nootropics for “unleashing your mental titan.” Despite the question marks, I’m excited by this combination. The vegetarian, artificial-free design of the label & capsules is clean. Don’t expect any side effects or bad interactions with this stack. Affordable, if you’re a coffee drinker. KOIOS has Guarana-sourced caffeine and thus qualifies as a healthier, effective coffee alternative. Especially in consideration of the Starbucks prices these days. Poor ingredient forms. This is albatross hanging on KOIOS’ neck in this review. Wrong B vitamins. Wrong L-Tyrosine. Powder in lieu of Extracts. Diminished quality, my geeks. The proprietary blend hides all but two of the ingredient dosages. And while the dosages look adequate, I could use the assurance of actually seeing them. Misinformation on the website & a potentially false Supp Facts is a RED FLAG con in my book. Due the dilligent research on this company & product before buying. Physical athletes, eSport athletes, & genius doods/doodettes. The barbell throwing, dumbbell-curling jocks & the Counter-Striking, StarCrafting gamers. For the record, I’m both. KOIOS is sold online directly by the Koios manufacturers & through other various retailers. 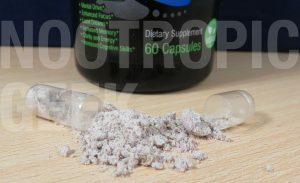 Although I didn’t cover them in this review (or any reviews yet), the KOIOS drink supplements are what initially led me to this series of nootropics. Very few manufacturers have mastered the liquid nootropic stack, so I figured if KOIOS is bold enough to venture into potable brain boosters, then KOIOS could more than handle capsulated stacks. Clearly, KOIOS knows what works for enhancing brainpower. Every ingredient choice in this formula is spot-on, combining for an impressive mix of nootropic bio-actions. Take notes from these selections. 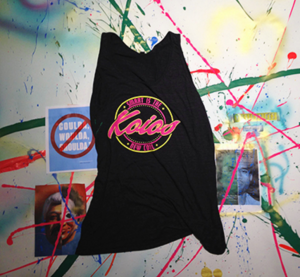 But stop taking notes on the forms of these ingredients (unless you’re the “10,000 ways not to make a light-bulb” Edison type), because KOIOS takes a major nose-dive in the quality department of its nootropics. 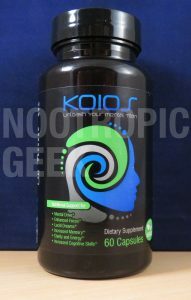 Considering KOIOS clearly knows what works for brainpower, I have to imagine they know their ingredients are low-grade. Seems like a (purposefully) missed opportunity to me. Yet, in the end, it’s an opportunity all the same. These ingredients will still enhance brain health to a certain degree. Just not to titan proportions.